All images via Bobby Finger. “The Rose.” It’s their light roast. “Doritos or Lays?” he asked. “Doritos,” I said without asking for him to clarify which flavors they stocked of each. The coffee was served immediately in a glass mug (oh, how I love glass mugs), and I was given a number to take to the seat of my choice. The one I wanted, which mimicked the round table in the girls’ kitchen and had a few square yards of Blanche’s bedroom wallpaper mounted behind it, was taken. Of course it was! It’s the best seat in the house. So I grabbed a chair at the runner up—the café’s large center table, at which 8-10 people could comfortably sit and get to know each other while watching an episode or two of the show. But I’m getting ahead of myself, so let’s go back a few minutes. 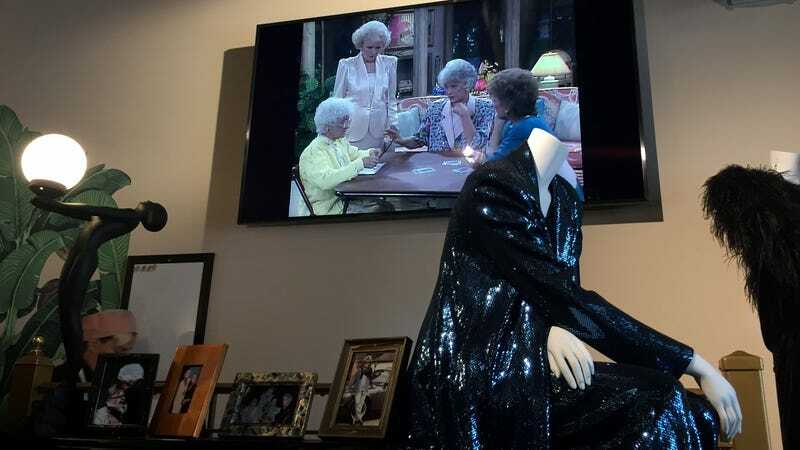 The feeling of walking inside Manhattan’s new Golden Girls-themed restaurant (co-owned by Michael La Rue) is one of numbed excitement, like waking up on Christmas morning as an adult and expecting something practical wrapped for you under the tree. The only version of a Golden Girls-themed café that could truly blow me away—make me clutch my bamboo purse tightly to my chest—would be a perfect reconstruction of the show’s Miami home where people are invited to eat cheesecake, Vanskapkaka, and baconlettuceandpotato sandwiches, as robot versions of the girls roam the space quoting lines from the show in a frightening monotone. If Rue La Rue Café wasn’t that (I knew it would not be that), then what could it possibly be? The answer, my friends, is oddly reverent and reverently odd. A place like Rue La Rue Café—with its mounted television playing every episode of the series in order, floor-to-ceiling memorabilia (La Rue has a “warehouse in Queens,” according to LaRue, filled with pieces that will rotate in and out of the café), and eclectic menu—looks like a place built by superfans with more experience watching the show than running a business. But there’s a palpable feeling of love in each of the café’s idiosyncrasies. No space is wasted here. After ordering, I sat down to watch the Season 4 classic “The Auction,” which had just begun. It’s one of the show’s multiple episodes about needing a large sum of money as soon as possible—this time for a new roof. Through a series of events I recommend you experience on Hulu (where the entire show is now streaming), the gals find themselves in the absurdly dark situation of bidding on a painting by a nasty artist (Jasper DeKimmel) who they know is dying, with the intention of selling it at a profit after his passing. I laughed along with my neighbors during the classic auction scene, and listened to one patron explain the first half of the episode to someone who showed up late. By the time Sophia was revealed to have saved DeKimmel’s life by donating her blood (they shared a “rare blood type”), my tuna sandwich and Doritos (Nacho Cheesier) had arrived. To my pleasant surprise, the sandwich was grilled on a panini press, and contained an amount of mayo many would call “disgusting.” I, however, call it “perfect.” I mean it! A perfect tuna sandwich. When a woman who appeared to be in her 70s approached me from behind and asked how it was (she’d ordered one too), I told her, “It’s perfect.” She was pleased, and so was I. After taking my last bite, which came soon after the next episode (“Blind Date”) began, I took a few minutes to digest and finish my coffee. In this episode, which is probably among the top 20 of the series, a handsome man asks Blanche out on a date, but it isn’t until he arrives at her door the following day that she realizes he can’t see. “Are you blinded by my beauty?” she asks him, to the horror of her roommates, who figured it out after noticing his walking stick. “Want a glass of water to wash down your foot?” Sophia quips. No! But you know what I did want? Cake! Not cheesecake, mind you, I’ve never been a big fan. (Sorry, Dorothy!) So after examining their options, I went with a slice of the “Betty White,” a white cake drowning in rich vanilla frosting and coated with a heavy dusting of coconut flakes. “It’s the best dessert on the menu,” the kind man reassured me while slicing a piece. Upon noticing my empty mug, he asked if I wanted more Rose (there was an accidental theme here), but I said no. It’s a decision I still regret. Better than it looks, somehow. While taking my first few bites, I noticed the woman in her 70s watching me from a nearby table, where she sat with three other women in their 70s. “He got that cake,” she whispered. “I think I have to get it.” It would be a decision she wouldn’t regret, as this cake was fantastic—dense, moist, and not as overwhelmingly sweet as it looked. I ate three-quarters before giving up and leaning back in my chair to finish the episode comfortably. A text conversation between the author and his sister. Before heading out I stopped by the bathroom, which was tiled to match the rarely-seen (and occasionally flooded) one from the show. I snapped a selfie in the mirror and took a moment to consider what a strange place this was. A themed restaurant in a quiet part of upper Manhattan—miles away from the tourist traps of Times Square (where one would assume this would be more appropriate), and a thousand more from the fictional Miami home that inspired it. Why the hell was this café even here? And why now? I think the answer to that question is the same one that keeps people returning to The Golden Girls after three decades on the air. Because it’s comfortable. Because it makes people feel good. Rue McClanahan understood that—it’s why she kept so much of the show’s memorabilia. So did her son. And so did her friend Michael La Rue. To sit in this place and eat a comforting meal while surrounded by the sounds of a show you know by heart, possessions once owned by its late star, and strangers with whom you share at least one love is an absurd and joyful experience that I’ve come to treasure more in the days since being inside. Like the show’s classic theme song, the signs that greet you upon entering and wish you well upon leaving say, “Thank you for being a friend.” And you know what? I think they mean it. I treasured the entire experience. If only there had been more wicker.